Why is Judaism classified as an ethnic religion? The start of Judaism was by patriarchs Abraham, Isaac, & Jacob. The origin of Judaism dates back 4,000 years ago near the ancient eastern region of Canaan(which is now Israel & Palestine territories). Start of Judaism as a religion was at Mount Sinai when Hashem (God) gave the Ten Commandments to the Jewish nation at Mount Sinai. 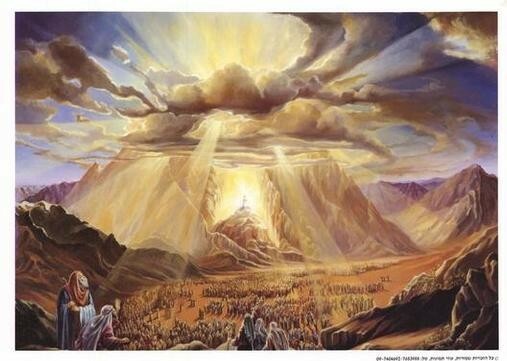 From then on for forty years the Jewish people wandered in the Sinai desserts and Moses taught them the Torah, as he heard it from Hashem (God). The picture on the right is Mount Sinai. Jews believe in the Torah, which was the whole of all laws given to Iraelities at Sinai. They believe that there is only one God, which means it is a monotheistic faith. They believe that they are connected with each other, wherever they live in the world. They believe they must follow God's laws which govern daily life. They believe that goodness and obedience will be rewarded and sin punished by God’s judgment after death. Then at the end of times, God will send his Messiah to redeem the Jews and deliver them to their Promised Land. It is classified as an ethnic religion. In North America there are 3 main branches of Judaism: Orthodox, Reform, and Conservative. Orthodox Jews are the strictest. They separate men and women from the services, follow strict kosher dietary, or food, laws- no pork or crawling seafood, no mixing of milk and meat products, among other laws. Reform Jews are most liberal and seeks to adapt traditional ways to modern times. They hold the Torah as authoritative. Reform Judaism does not believe, by and large, of the coming of a personal leader, but rather in the period of time that God will rule. Conservative Judaism is somewhere between Reform and Orthodox. Conservative Jews keep dietary laws and emphasize Hebrew, the Jewish language. They favor the families sitting together in services and seek to interpret ancient laws for modern life and education. Diffusion began when Abraham migrated from present-day Iraq to Canaan. Most ethnic religions don't diffuse widely, but Judaism is an exception. It is practiced in many places and not just its place of origin. In 70 CE, the Romans forced Jews out of the Middle East into Europe – some went to N. Africa and Asia. This had shaped the identity of Jews because they have been considered as an ethnic minority compared to other nationalities. During World World 2, many Jewish survivors migrated to Israel. The Temple Mount, also known as Har haBáyith is one of the most religious places for Jews to visit in Old City of Jerusalem . Jews regard this place as a place where God chose the Divine Presence to rest. It is an important for many events such as the location from which the world expanded into its present form, Abraham's binding of Isaac, Jacob's dream,the threshing floor which King David purchased from Araunah the Jebusite,and the location of the two Jewish Temples. Jerusalem is known as one of the holiest places for Jews , which is a spiritual center since 10th century BCE. The Four Holy Cities in Judaism are cities of Jerusalem, Hebron, Tiberias, and Safed. Where is it practiced today? It is practiced mostly in Israel, some parts of North & South America, Europe, and Asia. Areas where Jews are found the least are in few Muslim countries because they don't allow Jews. EX: Saudi Arabia. 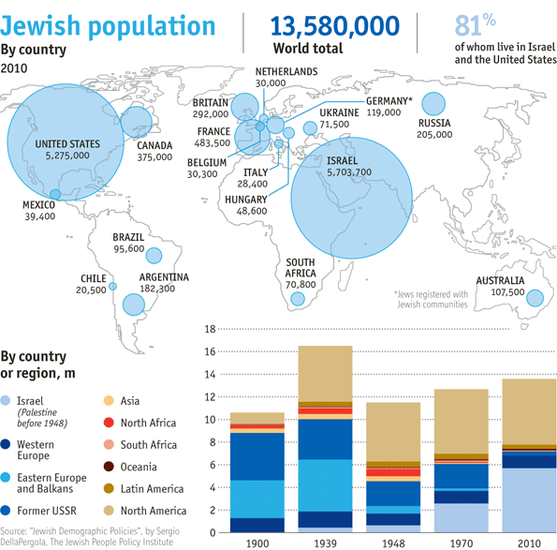 Population of Jews worldwide is estimated over 14 million , with the largest in Israel (42%)& US(42%). They are also found in Russia, UK, France, & Canada. About 6 million Jews live in US, 4 million in Israel, 2 million in former Soviet Union republics ,especially Russia, Belarus, Lithuania, & Ukraine, and 2 million elsewhere. They are heavily concentrated in large cities, including 1/3 in New York alone. Abraham was the founder of Judaism and also the first Jew. He was born in Ur of the Chaldees, and later moved northwest from there where he received a call at the age of 75. The Lord said: "Leave your country, your people and your father's household and go to the land I will show you. I will make you into a great nation and I will bless you; I will make your name great, and you will be a blessing. I will bless those who bless you, and whoever curses you I will curse; and all peoples on earth will be blessed through you." So he decided to take his wife, Sarai, and from Haran to Schechem in Canaan. He then entered covenant with God. He is now known as "Father of many nations" and Sarai became Sarah. Isaac was son of Abraham & Sarah. He was one of the three patriarchs of Iraelites. The most famous story about Isaac is his near-sacrifice. When Isaac was young, God told Abraham to sacrifice him. Abraham was upset, so he took Isaac and set out to Mount Moriah. When Abraham put Isaac on the altar, an angel told him to stop. God provided a ram for them to sacrifice instead. Jacob, also known as Israel as described in the Hebrew Bible, Talmud, New Testament, & Qur'an, was the third patriarch of the Hebrew people. He is the son of Isaac & Rebekah. He was named "Israel" by God, which means "God contended". The Torah is Judaism's most important text. It contains stories and commandments that teach us about life and death. It is written on scrolls and kept in a special cabinet called the aron hakodish. It is read with a pointer called yad (hand) to keep it from getting spoiled. Each week, a section is read until the entire Torah is completed. Worship no other God but me. Do not make images to worship. Observe the Sabbath Day (Saturday). Keep it Holy. Do not accuse anyone falsely. Do not tell lies about other people. The Tanakh is also the sacred text of Judaism. 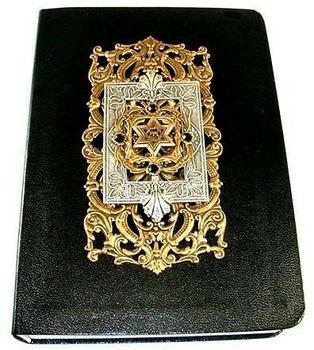 It consists of 39 books- 5 books of the Torah, 21 books of the Prophets, 12 books of Writings. 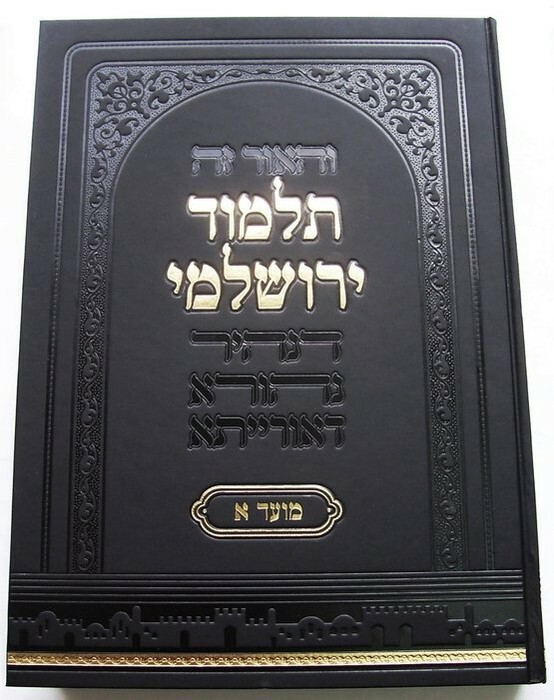 The Talmud is a collection of rabbinical writings that interpret, explain, and apply the Torah scriptures. The Star of David is shaped as an hexagram, with two equilateral triangles. It was used as a symbol of Judaism since 17th century with precendents in 14th-16th century in Central Europe. The Menorah is described in the Bible as a 7-branched candelabrum made of gold and used in the portable sanctuary set up by Moses in the wilderness and later in the Temple in Jerusalem. 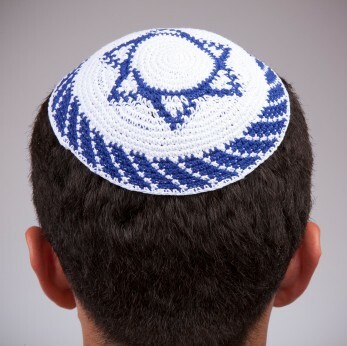 A kippah,also known as a yarmulke, is a hemispherical skullcap, usually made of cloth is often worn by Orthodox Jewish men to fulfill a customary requirement that their head be covered at all times. Even married women cover their head using a scarf to show modesty. Jewish people pray in a synagogue which is a center of the Jewish religious community, and is used for study and prayer as well as social activities. 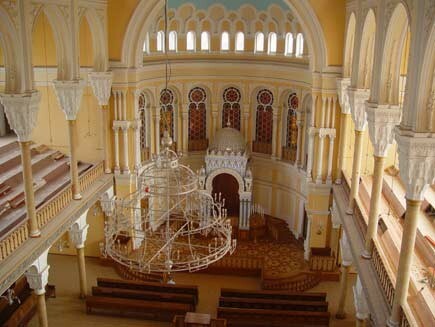 All synagogues contain a bimah, a table from which the Torah is read, and a desk for the prayer leader. Family structures-There is no prohibition in the Jewish law for women to work. A man is commanded to support his family, but for women, there is a choice. It is encouraged that if possible both parents take an active role in childbearing. A child may only have a full Jewish experience if he or she witnesses both the mother and father practicing Judaism. Social structures- There are different classes of people in Judaism Cohen- Priests, Levites, Israelites, & Proselyts . To raise a family is a sacred duty to Jews, and it is through family loyalty that they express loyalty to Judaism. Whenever Jews eat they hold a big prayer thanking God for everything in front of them. Fish is acceptable as long as it has fins and scales. All animals with split hooves and which chew the cud (including sheep and cows). Refrain from eating meat and dairy products at the same meal. No wine, unless its kosher wine. All meat has to be prepared by a qualified kosher butcher. If meat was eaten in the same day, one must wait six hours before consuming any dairy products. Boys are recognized as full members of the community when they turn 13, when they celebrate a bar mitzvah. Girls celebrate a bat mitzvah when they are 12 or 13. Chava. "The Origin of Judaism." Origin of Judaism. Sept.-Oct. 2010. 06 Dec. 2012 <http://www.orthodox-jews.com/origin-of-judaism.html>. Dan. "Protected: Jedidiah Is Born." Yeshua Preparedness. 12 Nov. 2012. 5 Dec. 2012 <http://yeshuapreparedness.wordpress.com/>. Features of Synagogues. 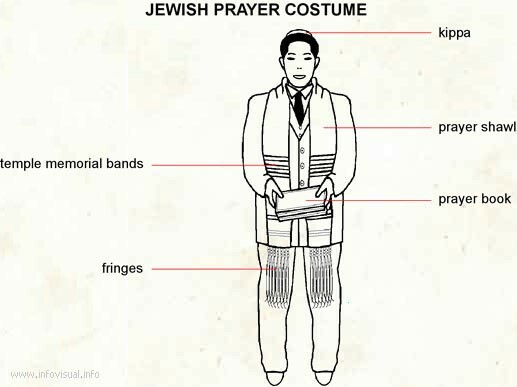 5 Nov. 2012 <http://chunkymonkey11.jimdo.com/features_of_synagogues.php>. "Â ." Food Restrictions. 06 Dec. 2012 <http://www.butlersguild.com/index.php?subject=103>. Hammer, Joshua. "Smithsonian.com." Smithsonian magazine. 2011. 06 Dec. 2012 <http://www.smithsonianmag.com/history-archaeology/What-is-Beneath-the-Temple-Mount.html>. Hel, Brother-Sister. "Atheist Bible Study: "God Said to Abraham, Kill Me a Son"" Godswill Ministries. 25 Feb. 2012. 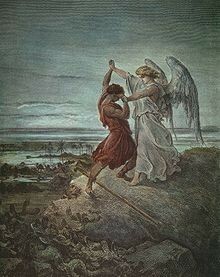 5 Nov. 2012 <http://godswillchurch.com/2012/02/atheist-bible-study-god-said-to-abraham-kill-me-a-son/>. "Holy places." Wikipedia. 12 Mar. 2012. Wikimedia Foundation. 06 Dec. 2012 <http://en.wikipedia.org/wiki/Holy_places>. "Jewish Symbols and Their Meanings." Jewish Symbols and Their Meanings. 06 Dec. 2012 <http://www.ancient-symbols.com/jewish_symbols.html>. ": Judaism." : Judaism. 30 Apr. 2010. Wiki. 06 Dec. 2012 <http://www.lewishistoricalsociety.com/wiki/tiki-read_article.php?articleId=113>. "Judaism 101: The Patriarchs and the Origins of Judaism." Judaism 101: The Patriarchs and the Origins of Judaism. 06 Dec. 2012 <http://www.jewfaq.org/origins.htm>. "Judaism; Key figures." Judaism; Key figures. 06 Dec. 2012 <http://worldreligions2.tripod.com/id4.html>. "Judaism." Wikipedia. 12 Apr. 2012. Wikimedia Foundation. 06 Dec. 2012 <http://en.wikipedia.org/wiki/Judaism>. "Library." Judaism Origins, Judaism History, Judaism Beliefs. 06 Dec. 2012 <http://www.patheos.com/Library/Judaism.html>. Pelaia, Ariela. "What Do JewsÂ Believe?" About.com Judaism. 06 Dec. 2012 <http://judaism.about.com/od/judaismbasics/a/whatdojewsbelieve.htm>. SodaHead. 5 Dec. 2012 <http://www.sodahead.com/living/do-you-have-a-favourite-book-of-the-tanakhjewish-bible/question-1120977/?link=ibaf&q=&imgurl=http://images.sodahead.com/polls/001120977/jobibleLeather_JPS_English_Tanakh_Style_BB55_xlarge.jpeg>. "Traditional Jewish Education: The Torah and The Talmud." Jews and Mexicans: Here and there. 5 Dec. 2012 <http://macaulay.cuny.edu/eportfolios/friedlander12/education/jewish-education/955-2/>. "Volume 6: Clothing." 5 Nov. 2012 <http://www.infovisual.info/06/072_en.html>. "Where is Judaism practiced?" Www.findthedata.org. 06 Dec. 2012 <http://religions.findthedata.org/q/2/1462/Where-is-Judaism-practiced>. WorldJewishDaily.com. 5 Nov. 2012 <http://www.worldjewishdaily.com/kippot-jordan.php>. "Places of Worship." Religion & Ethics. BBC. 5 Dec. 2012 <http://www.bbc.co.uk/religion/galleries/worship/>. Jewish Family Life and Structure. N.p., n.d. Web. 7 Dec. 2012. <http://www.bod.org.uk/content/FamilyLifeCustoms.pdf>. The Economist. The Economist Newspaper. 05 Dec. 2012 <http://www.economist.com/blogs/graphicdetail/2012/07/daily-chart-16*>. Also, used the book, The Cultural Landscape. "Short Introduction to Judaism!" Youtube. 20 Dec. 2010. 5 Dec. 2012 <http://www.youtube.com/watch?v=5TnKVYM9Euk>.